A four input, four output four wire box with two IFBs and extra features. 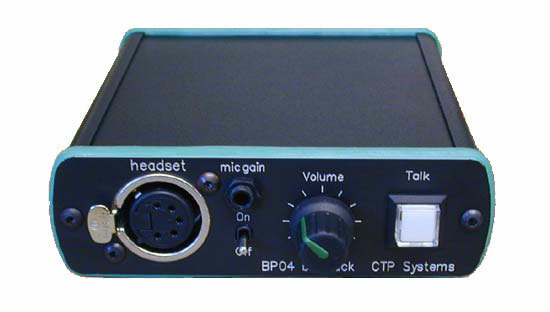 Switchable open talkback on output four. Four wires 1 & 2 operate as IFBs without loss of four wire inputs. Talk keys momentary (down) and latching (up). Rear panel switch to defeat key latching. Auto speaker off when headphone jack inserted. Rear panel speaker off switch. Selectable 12 volt phantom power on mic XLR. Rear panel speaker on/off switch. 2.5 watt RMS power amplifier. This is our new FW2010, a simple but high quality 2 input, 2 output four wire box with IFBs. Switchable open talkback on output two. Both four wires operate as IFBs without loss of four wire inputs. We have two versions of our 1RU four wires boxes. Please see further down for details of the FW6000XL. The FW6000 is designed for the user requiring six four wires and more basic IFB facilities. Keys up to latch, down for momentary. Rear panel key latch disable. Audio present LEDS on each channel. Separate mic amps with adjustable gain for headset and stalk mic. Speaker / stalkmic / headset select switching. Four wire inputs may be switched to operate as IFB interrupt feeds. DIP switches to enable IFB monitoring. Hot line level microphone output. Headphone socket suitable for both A and B gauge jacks. Transformers on all inputs and outputs. 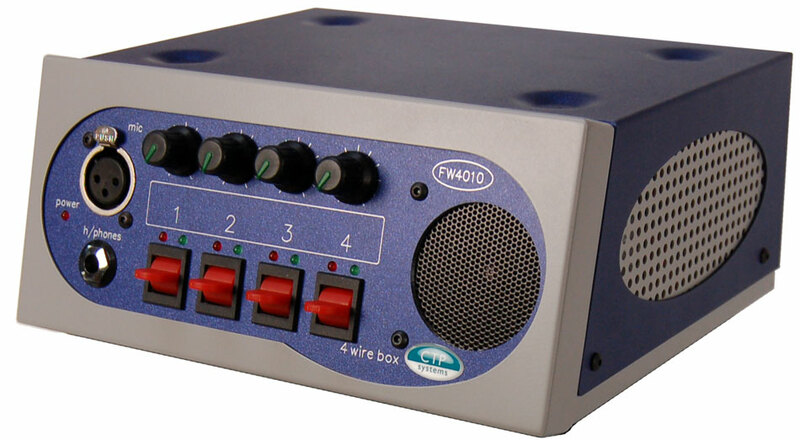 The FW6000XL has all the facilities of the FW6000 but has an additional four IFB interrupt inputs which may be delegated to any or all of the unit's four wire outputs. Each channel's volume control may be selected via front panel push buttons to listen to either the channel four wire input or Interrupt input. Here is a view of the rear showing the IFB delegation. The Boombox is a three input one output four wire box for use with a headset and with an overall volume control. There is a GPI input for footswitch controlled talk. All three inputs and the single output are on one RJ45 connection. Each input may be selected to left/right/both earpieces. The unit can be supplied to work on 12Vdc or 110-240Vac mains.